It is the leaves of the basil plant that are used in cooking, and these leaves can range from green to reddish to purple in color, depending on the variety. There are more than 60 different varieties of basil, each with its own distinct flavor. These flavors include hints of lemon, thyme, jasmine, clove, cinnamon, and anise. For best flavor, the leaves should be picked before the plant begins to flower. As an added benefit to growing your own, basil is said to repel flies, mosquitoes and cockroaches. Although basil is an annual, it is often pinched back to keep it from flowering and extending its growth period. Many home cooks keep basil growing year-round in pots indoors in a sunny window to have fresh basil at their fingertips. If you do not have the luxury of a basil plant, you can still find fresh basil leaves in most local grocery stores in the produce department. Look for fresh, vibrant green leaves with no dark spots or signs of decay. Fresh basil leaves should be layered in damp paper towels inside a plastic bag and refrigerated up to 4 days. For basil with stalks attached, place in a glass of water and cover with a plastic bag secured to the glass. Store in the refrigerator, changing water daily, and use within a week. Do not wash the leaves until you are ready to use them. Another option is to put whole or chopped fresh leaves in an ice cube tray and cover with water or broth before freezing. Once frozen, pop the cubes out into an airtight bag. Use the cubes in soups, stews or sauces. 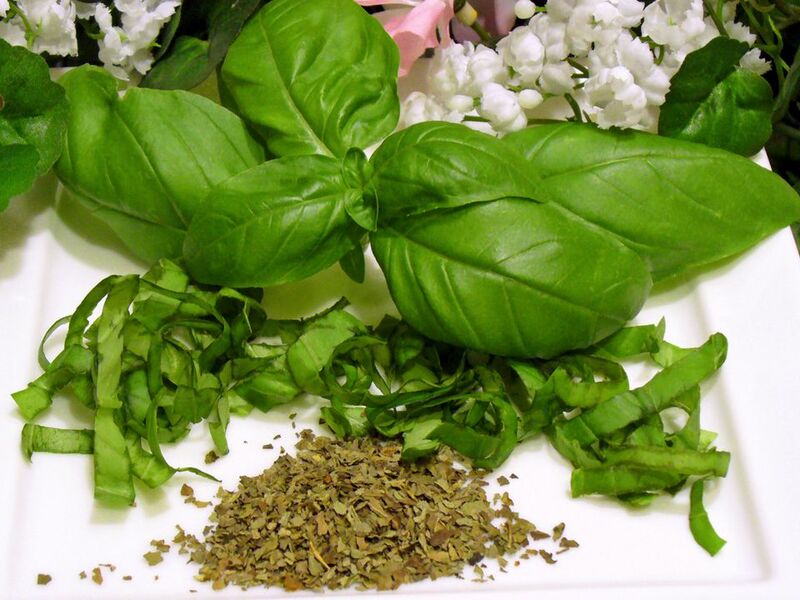 Basil is readily available in dried form, but it cannot compare in flavor to fresh basil. Dried basil should be stored in a cool, dark place away from heat and light. Dried herbs begin to lose their potency within 6 months, even under the best conditions. Bear in mind that dried basil can easily have been sitting on your grocer's shelf for months by the time you buy it. So unless you use copious amounts and go through it quickly, it is best to buy small amounts so you can use it up faster. When dried, basil loses much of its intensity.